As part of the Schoolhouse Crew Review team, I’ve been given the opportunity to share my thoughts upon a few of the heath and beauty care products by Koru Naturals! I received Emu Oil & Manuka Oil & Honey Shampoo and Conditioner to review. We’ve been enduring an early Spring in Oregon and with that comes several skin irritations from eczema that needs controlled to uncomfortable contact rashes. Each of these products couldn’t have come at a better time for my family to use in aiding our skin care needs be it for health, happiness, or both! About the Company: Koru Naturals is an on-line retail store that’s located in North Carolina, USA that imports numerous beauty & skin care products from New Zealand and Australia. The products that are offered are many and vary from bath salts, lotions, creams, lip balms, soaps, teas, and more! The main ingredients in many of their products are lanolin, manuka honey, manuka oil, and Emu oil. The products they offer are very beneficial having amazing healing benefits. The products never tested on animals. 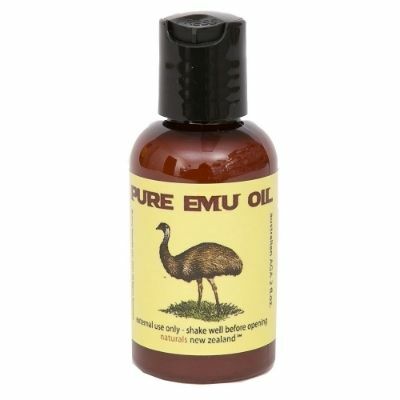 Emu Oil (2 ounces | $9.85): The Emu Oil comes in 2oz, 4 oz, and 8oz sizes. I’ve been using a 2 ounce bottle of it on myself and my two children age 4 and 6 years old for a little over a month. It contains all natural ingredients, vitamins, essential fatty acids, and minerals. It’s not diluted and contains zero preservatives or additives. Emu Oil in the palm of my hand. I’m still learning about all the benefits of Emu oil. What I’ve learned so far is that it can be used reduce inflammation & swelling, moisture skin, soothe a sunburn, eliminate split ends, and so forth! It’s hypoallergenic and doesn’t clog pores. The oil is has a rich and creamy consistency that absorbs quickly into the skin. It has no smell, as far as I can tell. A little bit goes a long way as I’ve hardly made a dent in the oil even though I’ve been using it daily for six weeks. The bottle I received is brown in color. It’s presented this way to preserve all bioactive ingredients. It features a disc top with a tilt closures. This top is designed to dispense the oil without too much coming out at once. The toggle-type closure makes it easy to use the bottle one handed! This is a good choice of lid because it’ll prevent unwanted spilling and makes things uncomplicated when applying. Disc top with a tilt closure. The Emu oil on my son’s eczema hot spots ( elbows, front & back of his knees, and face) has been working wonderfully in keeping it under control. If I’m find him itching all over especially after playing outdoors in the grass and dirt, I opt to add about a teaspoon to his bath and he tells me he feels great after. With daily use, his skin has been looking better than ever which makes me very happy! I used the Emu oil on a sore spot on my back that was bruised, swelling, and irritated. After a day, my pain was completely gone! I can’t believe how fast acting the oil worked. It did wonders compared to the pain killers I took that only appeared to mask the irritation. I’ve been using this oil for so many things. It’s a fantastic make up remover and has kept my face free from being overly dry! I’m quite the fan of this oil and will keep it around for the number of skin care needs my family may have. 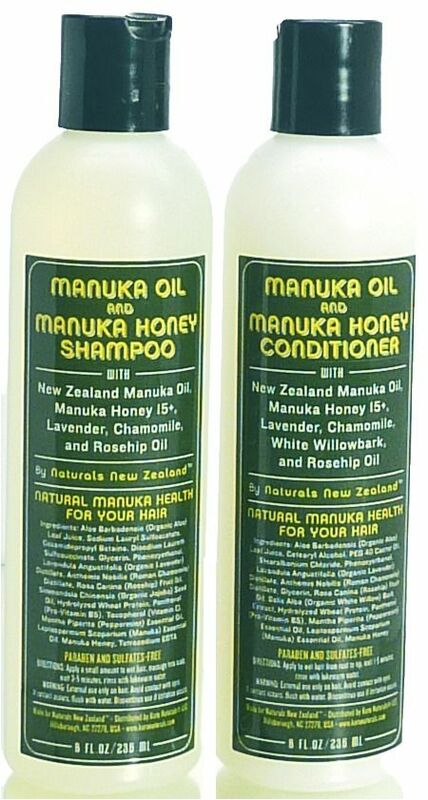 Manuka Oil and Honey Shampoo and Conditioner ($14.95 | 8 FL OZ. ): My hair had been looking a bit frazzled on the ends since I’d bleached it last year. I had not been able to restore it to it’s previous state and was debating just cutting it off. I had started coconut oil treatments out of desperation. It was going okay but I wasn’t really keen on wearing my hair in saran wrap for hours on end a few times a week. I was floored when after only a week of using the Manuka Oil Shampoo and Conditioner set that my hair had been restored to it’s previous glory! A few of the natural ingredients to be found in shampoo and conditioner set include Manuka Oil, Manuka Honey, Lavender, Chamomile, Peppermint and Rosehip Oil. The Manuka Oil and Honey are natural antiseptics and remove hair of any impurities. I feel that the combination of ingredients smell amazingly invigorating and leave me feeling quite refreshed and wakeful after use. The set is color safe and I can vouch that neither have faded my latest box dye job at all. The consistency of the shampoo & conditioner isn’t watery or overly thick. The lather is very minimal which is common in shampoos free from sulfates (it’s free from parabens too!). Each does the job adequately despite not being being super sudsy. The bottle labels are easy to read and haven’t shown any signs of peeling being left in a damp bathroom. The ingredients, instructions, and company information is printed on each label. The caps feature toggle-type closure which make using either quite manageable one handed. I love how much healthier looking and softer feeling my hair is. After using these, my head tingles for a bit but not in a painful discomforting way. I found it interesting in how it recommend keeping both the shampoo and conditioner on for several minutes before rinsing. I think it just helps to have a deeper wash and conditionin. Whatever the case, this set works amazingly. I haven’t used these on my children because it’s not tear free plus mommy just doesn’t want to share. Overall Thoughts: I highly recommend both the Emu Oil (2 oz. $9.85) & Manuka Oil and Honey Shampoo and Conditioner set ($14.95 |Two 8 oz. bottles) from Koru Naturals. There’s no cons that I can think of and I feel that each are reasonably priced. After such could results from these products, I’m eager to check out more products from the company myself!